My 5 year cross-stitch project. In the early days of my college life, I went to the craft store looking for a project to keep me out of trouble. (A great big LOL!) 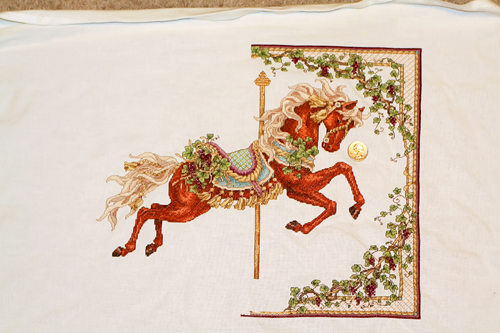 I picked up a kit to make this carousel horse…. Why a carousel horse, you ask? I don’t know. I think because it was pretty. It was pink. And I knew it would be a challenge. It took me 5 years to complete. Granted I wasn’t working on it non-stop. I had papers to write, finals to take, and parties to go to. *wink* I got it framed just after Wade and I got married and just before we moved to Colorado. It has a prominent spot in the upstairs hallway…you can’t miss it. Then, I came across the information that my horse was only one in a series of four horses. One for each season. 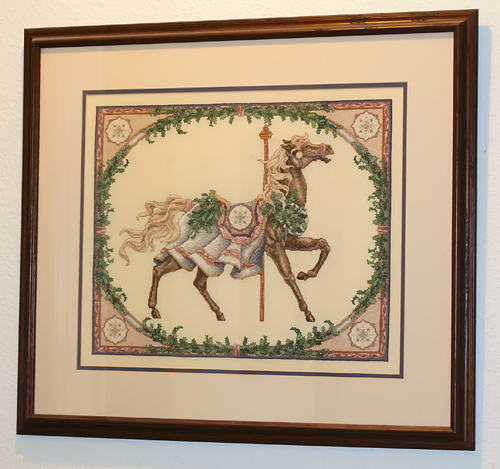 The horse I have hanging in my hall is the Winter horse. I immediately started looking for the other patterns. (Still baffled by my obsession. I’m not “into” carousel horses per se….but these are just so pretty! )Â I got the wild hair that I would complete all four horses, have them framed, and then hang each according to what season it was. Kind of like a changing of the guard. Enter Ebay. I found each of the other three (discontinued) patterns and eventually won them all at auction. 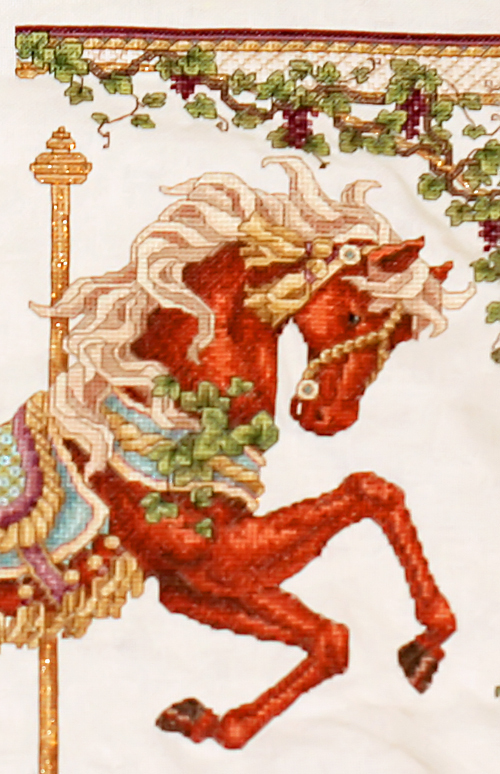 I’m not sure how I decided, but I chose the Autumn horse to work on next. I began the project on 9-1-03. I had an 8 month old, Tyler was starting preschool, and I was in the middle of getting certified to teach Jazzercise. I thought I needed another project. oy. At some point, I lost interest. When I picked it back up about this time last year, there was no neck piece, no horse head or mane, no pole and definitely no border. I am really trying my best to get this done and framed by this fall so that I can begin my changing ritual. I think that in my second round of 21 days to a habit, I will include cross-stitching just a little each day. I really do love it. too funny! your ambivalence doesn’t show — the carousel horses are absolutely beautiful. just think by the time benji graduates from highschool you’ll have a complete set. I feel the same way about my knitting projects, except I get distracted by the pretty yarn and start a new project before finishing the old. Wow, that is much larger than I thought, I can see why it took so long. I think that it’s great to finish such a complicated project, no matter how long it takes you. Make sure to invite us over for an “unveiling” of your autumn horse! I have all of those patterns from when they were first released and feel exactly the same way you do! Don’t necessarily have a thing for carousel horses, but those patterns were way to cool to pass up! Of course I never got mine started, 4 kids in 6 years killed my cross stitching habit very quickly! Love the cross-stitching, can’t wait to see the layout!